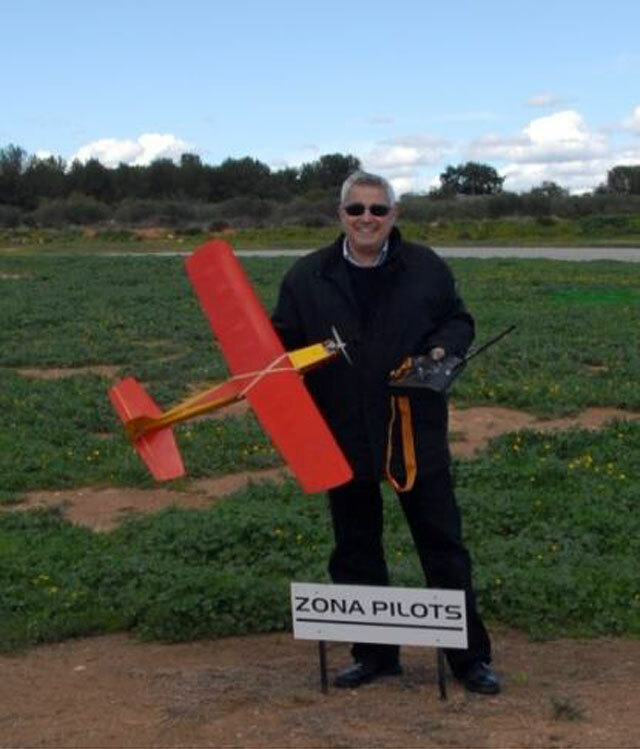 Outerzone : Half a century flying! I built the Mini Comet (oz8531) in 1967. Powered by a Cox Tee Dee 0.051, it was my first engine model. I drew myself the plan at full scale from the article published in Aeromodeller in January 1966. At the beginning it was finished in red, yellow and grey, according to the image on the magazine (image 1). The home-made radio was also similar to the one showed: a single tone Tx working at 27MHz and a super-regenerative Rx. Instead of the rubber escapement I put a 'modern' single channel rudder servo, all fed by one 9V dry battery plus tree AA dry cells. Initially, an OS servo (blue aluminium case, on image 2) was mounted into. 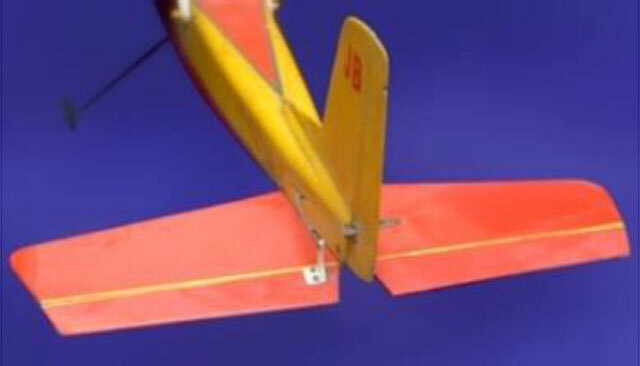 This had been working well into a glider, but it was affected by the vibrations of the glow motor. It started trembling as soon as Cox ran and the range of the radio, usually very good, was drastically reduced. This trouble was easy solved exchanging the OS by an "Orient Dynamite Rudder Servo" (the other one on the image). The whole was working properly for years without any crash. On these days, the young Tee Dee delivered a good power, even without nitro. The fuel was 25% pure castor oil and 75% methanol, mixed at home. The enormous tank allowed flights of more than 20 min, always at full throttle. 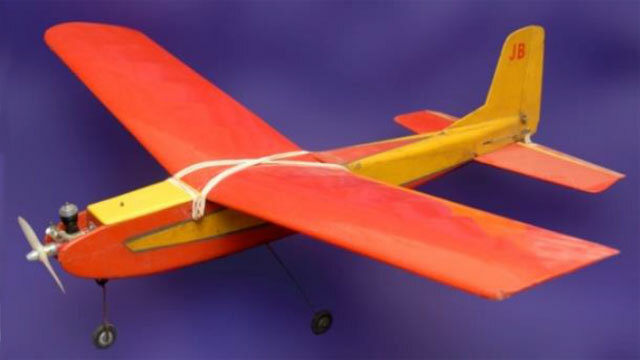 The flight was gentle and pleasant (too long to describe here the capabilities of a rudder only model) but the best occurred when the Tee Dee stopped: a superb nose-up gliding, finishing every time with a smooth and elegant landing. After some years the super-regenerative Rx becomes unusable. Yes, my friends, to fly with this sort of receiver it is imperative that absolutely all transmitters must be off (in these days the 27Mhz was the most popular RC band). That is hard to get when the number of modelers in the field increases. Then at the end of '70s I was obliged to upgrade the Mini Comet. Wings, stabilizer and tank trap were Mylar covered, instead of the original doped and painted silkspan. An elevator was added and 2 axes proportional control was allowed by means of a Graupnner-Grundig Varioprop 12 radio. The on board equipment was quite heavy: 2 plugged modules Rx, 2 linear servos (55g each) and, at the beginning, a 500mA CdNi battery! Despite the extra weight the Mini Comet took off, running and jumping like a rabbit no less than 100m, obviously the climbing rate was not extraordinary. Later, a lighter 225mA battery relieved the problem. A few years later, 27Mhz digital radios, like Varioprop, become obsolete for aeromodels and then my Mini Comet went into a long sleep on the top of an armoire ... up to 2014, when I retired and I was able to rededicate myself to my old and yearned-for hobby. The last and definitive (???) changes have been on the electronics, mounting: Tx and Rx 35Mhz Mutiplex Profi, a high end radio in 1980, two Ripmax-Futaba "micro servos" also from the '80s and a home-made pack of modern 300ma Li-ion cells, put under the tank. Prior to all, it was necessary to remove a big amount of accumulated dust and also freed the Cox Tee Dee, that was stuck due to solidified castor oil remains. Today, the vintage radio continues working well. The motor looks a little tired, but helped by 15% nitro fuel, it runs well also. In short, the 1967 Mini Comet flies again. Not bad for a 50 year old model ... and an even older pilot!! !